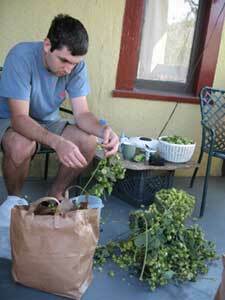 A huge thanks to Joe and Lindsay for snagging some fresh hops for me while at hop madness this year. They brought me 3 bags and a small tub of Willamette and Crystal hops. 13 oz fresh Willamette @ 5 min. 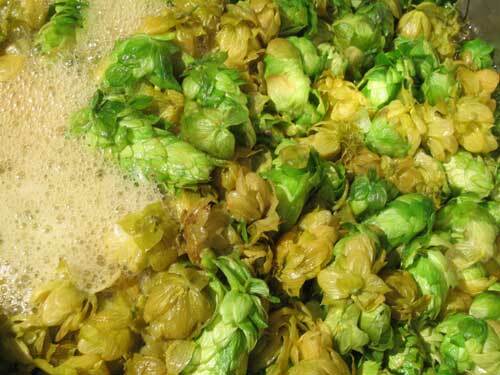 Yup – that’s 34 ounces of fresh hops – almost all under 10 minutes. The kettle got rather difficult to stir by that point, but I made sure to turn the hops into the boil to extract their precious lupalin. After the boil, I had some trouble cooling the wort efficiently – even with an immersion wort chiller – because the hops were holding so much of the wort. Because of the heat (I’m guessing), one of my chiller fittings had loosened up enough to let some tap water in to the kettle. I stopped it early before it turned the beer into hop tea. The last part of the brew included slinging around my week-old daughter. She slept through it, but I’m still giving her assistant brewer credits. I racked the wort into a poly fermenter to try it out again. I also failed to make a started so I sprinkled dry Fermentis yeast (it says you can do it on the packet) onto the wort. Krausen isn’t exactly rapid, but I think there’s a leak in the bucket around the airlock letting CO2 out. I suspect this because the corner of the kitchen with the bucket smells absolutely fantastic. Upon Michelle’s insistance, I kegged and tapped Michella IPA #1, despite knowing it wasn’t any good. She had 2 sips before putting down the glass permanently. Maybe Barley will want some. Michelle thinks it tastes like line cleaner, I think it tastes sour from sitting on the hop-pellet laden trub too long. Either way, it’s no good. I racked Michella #2 as well, and it’s much better. It should be ready for consumption next week. 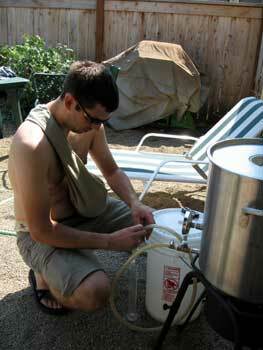 I kegged Michella IPA #1 and on Michelle’s insistence, but I have my doubts about it’s quality. I think I may have let the wort sit on the pelletized hops for too long. So as a backup, I brewed a second IPA yesterday with a different recipe. Joe was also on hand to audit my process and just BS to help pass the time. 2 oz Cascade @ 10 min. 2 oz Cascade @ 5 min. The wort tasted nice at pitching and had a temperature corrected OG of 1.053 and an estimated bitterness of 68IBU. Fermentation was active within 5 hours of pitching the yeast. woohoo! Just an observation. 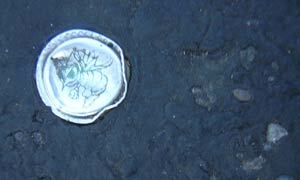 Is it me, or does it seem that every time you find a bottle cap embedded into the asphalt or discarded in a parking lot, it’s from a bottle of Mickey’s? 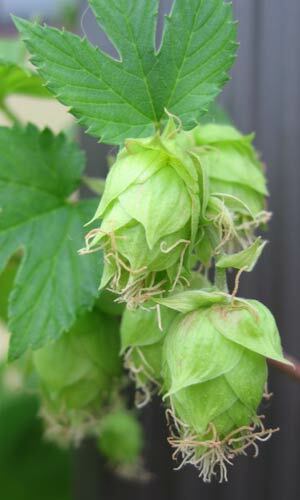 As it turns out, the little spikey flower things all over my hop plant are cones. The petals have started growing now and they really look like hops.The leaves on the lower part of the plant have started to yellow, and I’m not sure why. I’ve been watering sufficiently and I just added some all purpose veggie fertilizer. 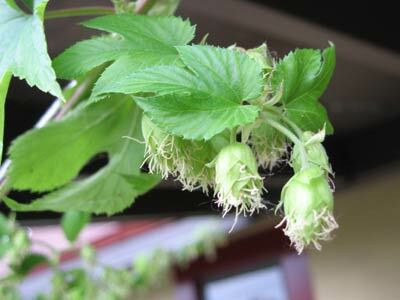 Still, I’m worried that the plant will go cones up before I can harvest and make a fresh hop brew.